Meanwhile, the episode also made great strides in Brianna (Sophie Skelton) and Roger’s (Richard Rankin) story in 1971. 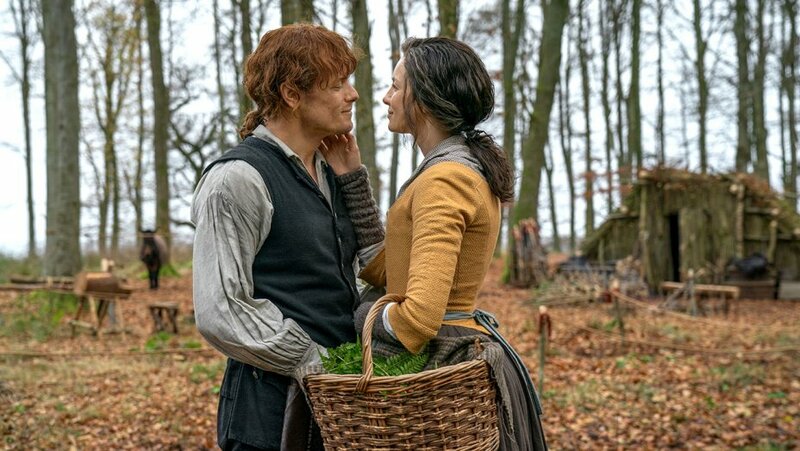 When Roger discovered the mention of Fraser’s Ridge in the book Bree gave him, he continued to dig deeper until he confirmed that it was Jamie. He called Bree to let her know, and they share a lovely, albeit short and guarded, phone conversation. But a while later, after he continued to research into the past, he was floored to read a news announcement of Jamie and Claire’s death by fire. He tried to call Bree again to update her, but her roommate picked up and revealed that Bree went to Scotland to “visit her mother weeks ago.” Did she go through the stones? Can Roger warn her in time? What’s going through Roger’s head in that moment the call ends? “‘Thank god she’s gone,'” Skelton jokes before Rankin considers the question seriously. For Bree, it didn’t take much to convince her to drop everything, leave her life behind and go back in time to her mother and the father she’s never met. But she also knows the risks, and still decides this was the right call to make. Very good interview. I guess Jamie saw the native americans as kindred spirits as time went on, seeing them and their issues were those as experienced by the Highlanders and the issues they faced. Yes, Brianna and Roger have a lot of communicating to do. Their relationship is a major struggle at the moment.